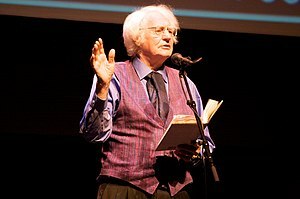 I first heard of Robert Bly when Iron John came out, so for a long time I associated him with the men’s movement rather than poetry. In fact I’ve only started reading much poetry recently, and was surprised to find out that Bly is not so much a drum-beating new age guru as an astoundingly prolific poet.Born in 1926 in rural Minnesota, Bly went to Harvard and spent some time on the east coast, but eventually came back to farm close to where he grew up. At the same time, he continued with his own poetry and worked with contemporary international poets as well. The journal he founded, The Fifties (the name being changed every ten years to reflect the passage of time) was influential in introducing international poetry to an American audience. Wind blows fine sand back toward the ocean. The flipper near me lies folded near the stomach, looking like an unfinished arm, lightly glazed with sand near the edges. I reach out and touch him. Suddenly he rears up, turns over, gives three cries. Awark! Awark! Awark!–like the cries from Christmas toys. Without that human presence, the poem wouldn’t have as much meaning. Personally, I can’t read this poem without wishing the guy had called a marine wildlife rescue service, but maybe this was written before there was such a thing. When I grew up we used to go on picnics to McClure’s Beach, so to me this place he’s talking about already has a well-formed place in my imagination. As soon as we’d get down the trail to the beach, I’d run out to this place at the edge of the water where the rocks tower up high. From the top of these rocks you can look down into a violent pool where the waves crash against the rock and, having no place to go, form a deep and frothy whirlpool. I never got tired of watching this, or of wandering up and down the beach seeing what the tides had brought in. To Bly, a midwesterner, the Pacific coast must have seemed nearly as outlandish as the moons of Saturn. His precise descriptions read like tales of wonder. My following poem will try to be realistic, and it will involve dragons. I’m also going to do a strange thing Bly did which I don’t understand, namely making only the first line of the poem past tense. I ran to the rocks and up. The tide is sweeps over the top, but I don’t slow until my hand meets seaweed moist as eelskin around the top of the horseshoe cove. Then I see the waves churn closer than I have ever seen them, kelp only ten feet down waving like a field of poppies in the movement of surf. In the flash of a second I know I’ve made a mistake: The tide is too high today, I have come too close to wildness, the wave is too near. A hand of foam grabs me, drags me over the top and down the very straws of seaweed I’m trying to clutch. I taste fear, my skin scrapes and fills with salt water, the hair blocking my vision may be a mercy. My feet find something to grab, a place where the shelter of rocks keeps the waves from bearing down, prevents all but a fraction of light from filtering through. The waves roar but cannot reach this strange room where kelp hangs in curtains like leather. No, they are leather, from which skin I dare not guess, hung with startling repetitive intelligence. No one put them there, I think. Then something moves and I step back, an eye shifts almost imperceptibly open and I can no longer move. When the darkness sheds a little forgiveness on my eyes, barnacles redefine themselves as scales of tarnished pearl; tattered boundaries melt out of the rock to become wings, and a question of light and shadow transforms into a face. That smell of gas I had not yet noticed becomes breath. At least seven hands hold tight to the body, which lies folded without energy. The eye, a sliver the color of serpentine, flits to one of the claws before pinning me with its harsh dimness. No snarl comes out when the mouth curls open, but teeth show, conspicuously white with points that narrow into diamonds. That claw holds something which he grasps with tattered vehemence. He is dying, I know this. Otherwise he would kill me. The creature should not have glanced at the claw. How else would I have guessed anything was there? He can’t allow me to take it, yet he couldn’t resist assuring himself of its security. There is no sign of treasure here, amid kelp and barnacles and water and stone, yet whatever he holds is so terribly precious that being in its presence is more painful than the salt in my wounds. I take one step forward, then two, then five, and I am upon him. In the flash of a second I know I’ve made a mistake. When I dive for the claw, he opens it. I see what was hidden, and know that for seeing it I must go with him. Now I understand why we needed to hide this wildness.